Halloween is brewing. Don't be left out in the moonlight without a few of these zingers to ward off werewolves and grumpy ghouls. All Saints Eve has some room for sinners, so boil up the ghoulash and offer a side of funny bones at the next monster bash. A few unearthly cackles never heard anyone! Or did they? Why are haunted houses always derelict? 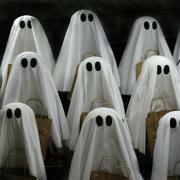 The ghosts hate to get their sheets dirty. Why do we yell "trick-or treat" on Halloween? Because it would sound strange at Christmas. 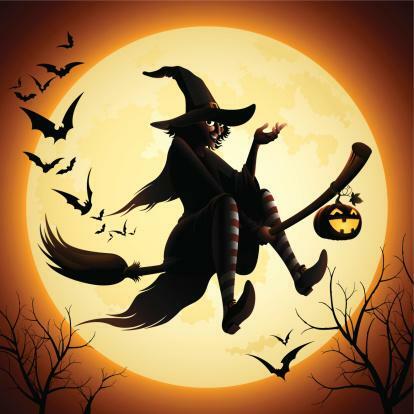 Why did the witches cancel their ball game? They couldn't find the bats! Ghosts make lousy friends. They are too transparent. Edna walked off the stage humiliated. She had never done her comedy routine to such a horrible and rude audience. The heckling was non-stop, and it took all she had to finish her set. "What happened out there?" Edna's friend asked. "You look so frustrated!" Edna let the car door close with a thunk. "It was awful. I never met such a rude audience. That's the last time I do stand-up in front of ghosts and let them boo me off the floor!" Tutankhamen sighed as he watched his friends go off to the Halloween bash. Jack O'Lantern stayed behind to keep his friend company. "Why are you missing the fun again, Tut?" Jack asked. The mummy sank into the couch littered with papers and threw up his hands. "Ugh, I'm just always so wrapped up!" What did the zombie dad do when his son rolled his eyes at him? As any good father, he just rolled them back to the boy. Why did the ghost start haunting the auto garage? Because the sign said it was a body shop. On what street do Zombies always live?